Frog owners have recently been presented with an interesting alternative to live insects and rodents as a pet food source. Continuing its trend of pioneering innovative, well-researched products, Zoo Med has introduced a powdered food that can be molded into various sizes and tong-fed to frogs. Although long-term studies on the value of commercial diets are lacking, experience indicates that some prepared/artificial diets have proven very useful. For example, thousands of generations of Mexican Axolotls have been bred (in research labs) on beef liver alone, African Clawed Frogs and many newts do well on Reptomin-based diets, and trout chow seems useful for American Bullfrogs. In both in zoos and my own collection, I have raised Mexican Axolotls and various newts, salamander larvae, and tadpoles primarily on trout chow and Reptomin. Zoo Med’s Pacman Food is eagerly accepted by African Bull and Horned Frogs (no surprises there -please see video below!) and Marine Toads. 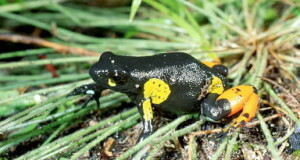 It’s likely that other “bold” amphibians, such as White’s Treefrogs, Fire Salamanders, American Toads, would be willing give this untraditional food a try as well. Why Consider a Prepared Diet? mouse-based diets, there are also risks…please see this article). Providing enough high-quality food can be a major undertaking – please see the article linked below to read about an African Bullfrog caught in the act of swallowing 17 baby cobras! Zoo Med’s product, which one mixes with a bit of water, can be molded into any size (or shape! 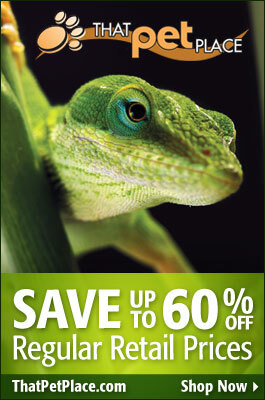 ), and so might be useful to people keeping dinner-plate sized amphibian behemoths. We do not have studies illustrating benefits or problems associated with this food; long-term success is claimed by a Japanese company manufacturing a related product. The examples I mentioned earlier (amphibians fed dry foods, liver, etc.) may be somewhat relevant, but we cannot draw any direct conclusions about Horned Frogs or others from these. 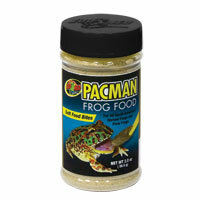 I would suggest trying Zoo Med Pacman food as a portion of your pets’ diets. Continue to provide as much variety as possible, and choose from nutritious foods such as roaches, earthworms, sowbugs, minnows, crickets and silkworms. 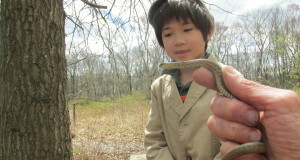 Please see the article linked below for other ideas, including the use of wild-caught insects. In posts on other sites, some folks have expressed concern over the plant-based ingredients in this product, or the fact that fish is used as a protein source. While on-point research is lacking, it is well-known that frogs and other carnivorous animals take in a good deal of plant matter in the course of feeding upon herbivorous prey species. Fish, which I and others have long fed to many large frogs, does not seem to present any problems. Zoo Med Pacman Food also contains added vitamins and minerals, including calcium and Vitamin D.
Those who have tried will not need this warning (I’m sure! ), but I should remind you not to feed Horned or African Bullfrogs with your fingers. The bony, tooth-like spikes that protrude from their jaws can inflict severe injuries. As most frogs seem to lack “self-control” when it comes to lunging at prey, use plastic feeding tongs only…sharp-edged metal models may injure your pets’ mouths.